George I, c. 1714. Studio of Sir Godfrey Kneller. 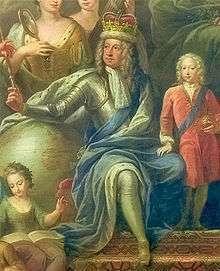 George I (George Louis; German: Georg Ludwig; 28 May 1660 – 11 June 1727) was King of Great Britain and Ireland from 1 August 1714 until his death, and ruler of the Duchy and Electorate of Brunswick-Lüneburg (Hanover) in the Holy Roman Empire from 1698. 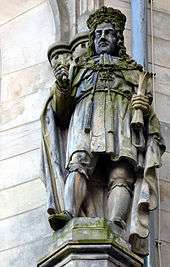 George was born in Hanover and inherited the titles and lands of the Duchy of Brunswick-Lüneburg from his father and uncles. A succession of European wars expanded his German domains during his lifetime, and in 1708 he was ratified as prince-elector of Hanover. At the age of 54, after the death of Queen Anne of Great Britain, George ascended the British throne as the first monarch of the House of Hanover. Although over fifty Roman Catholics bore closer blood relationships to Anne, the Act of Settlement 1701 prohibited Catholics from inheriting the British throne; George was Anne's closest living Protestant relative. In reaction, Jacobites attempted to depose George and replace him with Anne's Catholic half-brother, James Francis Edward Stuart, but their attempts failed. During George's reign, the powers of the monarchy diminished and Britain began a transition to the modern system of cabinet government led by a prime minister. Towards the end of his reign, actual political power was held by Sir Robert Walpole, now recognised as Britain's first de facto prime minister. George died of a stroke on a trip to his native Hanover, where he was buried. George was born on 28 May 1660 in Hanover in the Holy Roman Empire. He was the eldest son of Ernest Augustus, Duke of Brunswick-Lüneburg, and his wife, Sophia of the Palatinate. Sophia was the granddaughter of King James I of England through her mother, Elizabeth of Bohemia. For the first year of his life, George was the only heir to the German territories of his father and three childless uncles. In 1661 George's brother, Frederick Augustus, was born and the two boys (known as Görgen and Gustchen within the family) were brought up together. Their mother was absent for almost a year (1664–65) during a long convalescent holiday in Italy, but she corresponded regularly with her sons' governess and took a great interest in her sons' upbringing, even more so on her return. After Sophia's tour she bore Ernest Augustus another four sons and a daughter. In her letters, Sophia describes George as a responsible, conscientious child who set an example to his younger brothers and sisters. In 1679 another uncle died unexpectedly without sons and Ernest Augustus became reigning Duke of Calenberg-Göttingen, with his capital at Hanover. George's surviving uncle, George William of Celle, had married his mistress in order to legitimise his only daughter, Sophia Dorothea of Celle, but looked unlikely to have any further children. Under Salic law, where inheritance of territory was restricted to the male line, the succession of George and his brothers to the territories of their father and uncle now seemed secure. In 1682, the family agreed to adopt the principle of primogeniture, meaning George would inherit all the territory and not have to share it with his brothers. 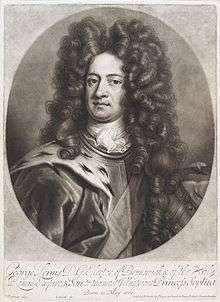 George in 1680, when he was Prince of Hanover. After a painting by Sir Godfrey Kneller. Ernest Augustus died on 23 January 1698 leaving all of his territories to George with the exception of the Prince-Bishopric of Osnabrück, an office he had held since 1661. George thus became Duke of Brunswick-Lüneburg (also known as Hanover, after its capital) as well as Archbannerbearer and a Prince-Elector of the Holy Roman Empire. His court in Hanover was graced by many cultural icons such as the mathematician and philosopher Gottfried Leibniz and the composers George Frideric Händel and Agostino Steffani. Shortly after George's accession to his paternal dukedom, Prince William, Duke of Gloucester, who was second-in-line to the English and Scottish thrones, died. By the terms of the English Act of Settlement 1701, George's mother, Sophia, was designated as the heir to the English throne if the then reigning monarch (William III) and his sister-in-law, Princess Anne of Denmark (later Queen Anne) died without surviving issue. The succession was so designed because Sophia was the closest Protestant relative of the British royal family. Fifty-six Catholics with superior hereditary claims were bypassed. The likelihood of any of them converting to Protestantism for the sake of the succession was remote; some had already refused. In August 1701, George was invested with the Order of the Garter and, within six weeks, the nearest Catholic claimant to the thrones, the former king James II, died. William III died the following March and was succeeded by Anne. Sophia became heiress presumptive to the new Queen of England. Sophia was in her seventy-first year, older than Anne by thirty-five years, but she was very fit and healthy and invested time and energy in securing the succession either for herself or her son. However, it was George who understood the complexities of English politics and constitutional law, which required further acts in 1705 to naturalise Sophia and her heirs as English subjects, and to detail arrangements for the transfer of power through a Regency Council. In the same year, George's surviving uncle died and he inherited further German dominions: the Principality of Lüneburg-Grubenhagen, centred at Celle. Sketch map of Hanover, c.1720, showing the relative locations of Hanover, Brunswick-Wolfenbüttel, and the Prince-Bishopric of Osnabrück. 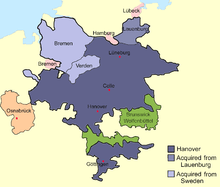 During George's lifetime Hanover acquired Lauenburg and Bremen-Verden. In 1706, the Elector of Bavaria was deprived of his offices and titles for siding with Louis against the Empire. The following year, George was invested as an Imperial Field Marshal with command of the imperial army stationed along the Rhine. His tenure was not altogether successful, partly because he was deceived by his ally, the Duke of Marlborough, into a diversionary attack, and partly because Emperor Joseph I appropriated the funds necessary for George's campaign for his own use. Despite this, the German princes thought that he had acquitted himself well. 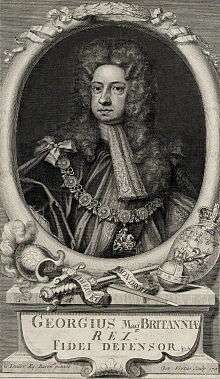 In 1708 they formally confirmed George's position as a Prince-Elector in recognition of, or because of, his service. George did not hold Marlborough's actions against him which he understood were part of a plan to lure French forces from the main attack. In 1709, George resigned as field marshal, never to go on active service again. In 1710, he was granted the dignity of Archtreasurer of the Empire, an office formerly held by the Elector Palatine—the absence of the Elector of Bavaria allowed a reshuffling of offices. The death of the Emperor in 1711 threatened to destroy the balance of power in the opposite direction, so the war ended in 1713 with the ratification of the Treaty of Utrecht. Philip was allowed to succeed to the Spanish throne but was removed from the French line of succession, and the Elector of Bavaria was restored. George c.1714, the year of his succession, as painted by Sir Godfrey Kneller. Though both England and Scotland recognised Anne as their queen, only the English Parliament had settled on Sophia, Electress of Hanover, as the heir presumptive. The Parliament of Scotland (the Estates) had not formally settled the succession question for the Scottish throne. In 1703, the Estates passed a bill that declared that their selection for Queen Anne's successor would not be the same individual as the successor to the English throne, unless England granted full freedom of trade to Scottish merchants in England and its colonies. At first Royal Assent was withheld, but the following year Anne capitulated to the wishes of the Estates and assent was granted to the bill, which became the Act of Security 1704. 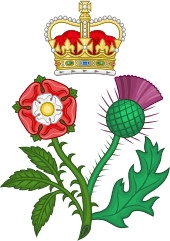 In response the English Parliament passed measures which threatened to restrict Anglo-Scottish trade and cripple the Scottish economy if the Estates did not agree to the Hanoverian succession. Eventually, in 1707, both Parliaments agreed on an Act of Union which united England and Scotland into a single political entity, the Kingdom of Great Britain, and established the rules of succession as laid down by the Act of Settlement 1701. The union created the largest free trade area in eighteenth-century Europe. Whig politicians believed Parliament had the right to determine the succession, and bestow it on the nearest Protestant relative of the Queen, while many Tories were more inclined to believe in the hereditary right of the Catholic Stuarts, who were nearer relations. In 1710, George announced that he would succeed in Britain by hereditary right, as the right had been removed from the Stuarts, and he retained it. "This declaration was meant to scotch any Whig interpretation that parliament had given him the kingdom [and] ... convince the Tories that he was no usurper." George's mother, the Electress Sophia, died on 28 May 1714 at the age of 83. She had collapsed in the gardens at Herrenhausen after rushing to shelter from a shower of rain. George was now Queen Anne's direct heir. He swiftly revised the membership of the Regency Council that would take power after Anne's death, as it was known that Anne's health was failing and politicians in Britain were jostling for power. She suffered a stroke, which left her unable to speak, and died on 1 August 1714. The list of regents was opened, the members sworn in, and George was proclaimed King of Great Britain and Ireland. Partly due to contrary winds, which kept him in The Hague awaiting passage, he did not arrive in Britain until 18 September. George was crowned at Westminster Abbey on 20 October. His coronation was accompanied by rioting in over twenty towns in England. 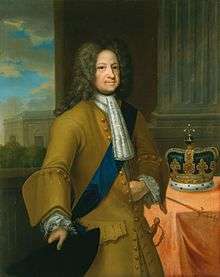 George mainly lived in Great Britain after 1714 though he visited his home in Hanover in 1716, 1719, 1720, 1723 and 1725; in total George spent about one fifth of his reign as King in Germany. A clause in the Act of Settlement that forbade the British monarch from leaving the country without Parliament's permission was unanimously repealed in 1716. During all but the first of the King's absences power was vested in a Regency Council rather than his son, George Augustus, Prince of Wales. George in 1718, by George Vertue, after Sir Godfrey Kneller. After his accession in Great Britain, George's relationship with his son (which had always been poor) worsened. George Augustus, Prince of Wales, encouraged opposition to his father's policies, including measures designed to increase religious freedom in Britain and expand Hanover's German territories at the expense of Sweden. In 1717 the birth of a grandson led to a major quarrel between George and the Prince of Wales. The King, supposedly following custom, appointed the Lord Chamberlain, the Duke of Newcastle, as one of the baptismal sponsors of the child. The King was angered when the Prince of Wales, disliking Newcastle, verbally insulted the Duke at the christening, which the Duke misunderstood as a challenge to a duel. The Prince was told to leave the royal residence, St. James's Palace. The Prince's new home, Leicester House, became a meeting place for the King's political opponents. George and his son were later reconciled at the insistence of Robert Walpole and the desire of the Princess of Wales, who had moved out with her husband but missed her children who had been left in the care of the King. However, following the quarrel at the baptism, father and son would never again be on cordial terms. George was active in directing British foreign policy during his early reign. In 1717 he contributed to the creation of the Triple Alliance, an anti-Spanish league composed of Great Britain, France and the United Provinces. In 1718 the Holy Roman Empire was added to the body which became known as the Quadruple Alliance. The subsequent War of the Quadruple Alliance involved the same issue as the War of the Spanish Succession. The Treaty of Utrecht (1713) had recognised the grandson of King Louis XIV of France, Philip, as the King of Spain on the condition that he gave up his rights to succeed to the French throne. Upon the death of Louis XIV in 1715, however, Philip sought to overturn the treaty. Spain supported a Jacobite-led invasion of Scotland in 1719 but stormy seas allowed only about three hundred Spanish troops to arrive in Scotland. A base was established at Eilean Donan Castle on the west Scottish coast in April, only for it to be destroyed by British ships a month later. Attempts by the Jacobites to recruit Scottish clansmen yielded a fighting force of only about a thousand men. The Jacobites were poorly equipped, and were easily defeated by British artillery at the Battle of Glen Shiel. The clansmen dispersed into the Highlands, and the Spaniards surrendered. The invasion never posed any serious threat to George's government. With the French this time fighting against him in the War, Philip's armies fared poorly. As a result, the Spanish and French thrones remained separate. Simultaneously Hanover gained from the resolution of the Great Northern War which had been caused by rivalry between Sweden and Russia for control of the Baltic. The Swedish territories of Bremen and Verden were ceded to Hanover in 1719, with Hanover paying Sweden monetary compensation for the loss of territory. A 1718 quarter-guinea coin from the reign of George I, showing him in profile. In Hanover, the King was absolute monarch. All government expenditure above 50 thalers (between 12 and 13 British pounds), and the appointment of all army officers, all ministers, and even government officials above the level of copyist, was in his personal control. In contrast, in Great Britain George had to govern through Parliament. In 1715 when the Whigs came to power, George's chief ministers included Sir Robert Walpole, Lord Townshend (Walpole's brother-in-law), Lord Stanhope and Lord Sunderland. In 1717 Lord Townshend was dismissed and Walpole resigned from the Cabinet over disagreements with their colleagues; Lord Stanhope became supreme in foreign affairs, and Lord Sunderland the same in domestic matters. Lord Sunderland's power began to wane in 1719. He introduced a Peerage Bill which attempted to limit the size of the House of Lords by restricting new creations. The measure would have solidified Sunderland's control of the House by preventing the creation of opposition peers but it was defeated after Walpole led the opposition to the bill by delivering what was considered "the most brilliant speech of his career". Walpole and Townshend were reappointed as ministers the following year and a new, supposedly unified, Whig government formed. George, although increasingly reliant on Walpole, could still have replaced his ministers at will. Walpole was actually afraid of being removed from office towards the end of George I's reign, but such fears were put to an end when George died during his sixth trip to his native Hanover since his accession as king. He suffered a stroke on the road between Delden and Nordhorn on 9 June 1727, and was taken by carriage to the Prince-Bishop's palace at Osnabrück where he died in the early hours of 11 June 1727. He was buried in the chapel of Leine Castle but his remains were moved to the chapel at Herrenhausen after World War II. George was succeeded by his son, George Augustus, who took the throne as George II. It was widely assumed, even by Walpole for a time, that George II planned to remove Walpole from office but was prevented from doing so by his queen, Caroline of Ansbach. 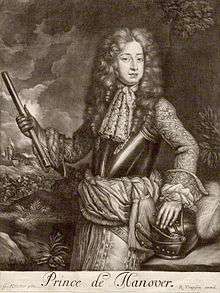 However, Walpole commanded a substantial majority in Parliament and George II had little choice but to retain him or risk ministerial instability. In subsequent reigns the power of the prime minister increased further at the expense of the power of the sovereign. In Great Britain George I used the official style "George, by the Grace of God, King of Great Britain, France and Ireland, Defender of the Faith, etc." In some cases (especially in treaties), the formula "Duke of Brunswick-Lüneburg, Archtreasurer and Prince-Elector of the Holy Roman Empire" was added before the phrase "etc." 1 2 3 Throughout George's life, Great Britain used the Old Style Julian calendar. Hanover adopted the New Style Gregorian calendar on 1 March 1700 (N.S.) / 19 February 1700 (O.S.). Old Style is used for dates in this article unless otherwise indicated; however, years are assumed to start from 1 January and not 25 March, which was the English New Year. ↑ The story that George I died in the same room as that in which he was born at Osnabrück (in, for example, Le Grand Dictionnaire Historique of 1759) is contradicted by the Electress Sophia in her Memoiren der Herzogin Sophie nachm. Kurfürstin von Hannover (ed. A. Köcher, Leipzig, 1879, pp. 1 and 68) who says that her two eldest sons were born at Hanover, and by four notifications from Hanover to the court at Wolfenbüttel preserved in the Wolfenbüttel state archives ( Huberty, Michel; Giraud, Alain; Magdelaine, F. et B. (1981). L'Allemagne Dynastique, Tome III (in French). Le Perreux: Alain Giraud. p. 85. ISBN 2-901138-03-9. ). 1 2 3 Weir, Alison (1996). Britain's Royal Families: The Complete Genealogy, Revised edition. Random House. pp. 272–276. ISBN 0-7126-7448-9. ↑ Hatton, Ragnhild (1978). George I: Elector and King. London: Thames and Hudson. pp. 26–28. ISBN 0-500-25060-X. ↑ Farquhar, Michael (2001). A Treasury of Royal Scandals. New York: Penguin Books. p. 152. ISBN 978-0-7394-2025-6. ↑ The Prince-Bishopric was not an hereditary title; instead it alternated between Protestant and Roman Catholic incumbents. ↑ Schemmel, B. "Hanover". rulers.org. Retrieved 21 August 2007. ↑ Schama, Simon (2001). 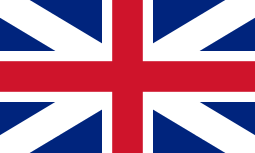 A History of Britain – The British Wars 1603–1776. BBC Worldwide Ltd. p. 336. ISBN 0-563-53747-7. ↑ Velde, François R. (26 September 2006). "Holy Roman Empire". Retrieved 20 August 2007. ↑ Whatley, Christopher A. (2001). Bought and Sold for English Gold? : Explaining the Union of 1707, Second edition. East Linton, Scotland: Tuckwell Press. ISBN 1-86232-140-X. ↑ Riley, P.W.J. (1978). The Union of England and Scotland: A Study in Anglo-Scottish Politics of the Eighteenth Century. Totowa, New Jersey: Rowman and Littlefield. ISBN 0-8476-6155-5. ↑ "The Treaty of Union". The Scottish Parliament. Archived from the original on 18 May 2007. Retrieved 20 August 2007. ↑ 8 June in the New Style Gregorian calendar adopted by Hanover in 1700. ↑ Monod, Paul Kleber (1993). Jacobitism and the English People, 1688–1788. Cambridge University Press. pp. 173–178. ISBN 978-0-521-44793-5. 1 2 Plumb, J. H. (1956). The First Four Georges. ↑ "George I". Official web site of the British monarchy. Retrieved 18 April 2016. ↑ Williams, Basil (1962). The Whig Supremacy 1714–1760. Second edition. Revised by C. H. Stuart. Oxford: Oxford University Press. pp. 151–152. ↑ "Septennial Act 1715 (c.38)". The UK Statute Law Database, Ministry of Justice. Retrieved 20 August 2007. ↑ Lease, Owen C. (1950). "The Septennial Act of 1716". The Journal of Modern History. 22: 42–47. doi:10.1086/237317. ↑ Dickinson, Harry T. (1973). Walpole and the Whig Supremacy. London, UK: The English Universities Press. p. 52. ISBN 0-340-11515-7. ↑ Arkell, R. L. (1937). "George I's Letters to His Daughter". The English Historical Review. 52: 492–499. doi:10.1093/ehr/LII.CCVII.492. ↑ Lenman, Bruce (1980). The Jacobite Risings in Britain 1689–1746. London: Eyre Methuen. pp. 192–193. ISBN 0-413-39650-9. ↑ Szechi, Daniel (1994). The Jacobites: Britain and Europe 1688–1788. Manchester and New York: Manchester University Press. pp. 109–110. ISBN 0-7190-3774-3. ↑ Carswell, John (1960). The South Sea Bubble. London: Cresset Press. p. 72. ↑ Erleigh, Viscount (1933). The South Sea Bubble. Manchester: Peter Davies Ltd. p. 65. ↑ Black, Jeremy (2001). Walpole in Power. Stroud, Gloucestershire, UK: Sutton Publishing. p. 20. ISBN 0-7509-2523-X. ↑ "Order of the Bath". Official website of the British monarchy. Retrieved 7 September 2009. ↑ "George I" (1911). Encyclopædia Britannica, 11th edition. London: Cambridge University Press. ↑ His younger brother, Ernest Augustus, Duke of York and Albany, was Prince-Bishop of Osnabrück from 1715 until 1728. ↑ 22 June in the New Style Gregorian calendar adopted by Hanover in 1700. ↑ Ashley, Mike (1998). The Mammoth Book of British Kings and Queens. London, UK: Robinson. p. 672. ISBN 1-84119-096-9. ↑ Thackeray, W. M. (1880) . The Four Georges: Sketches of Manners, Morals, Court and Town Life. London: Smith, Elder. pp. 52–53. ↑ Smith, Hannah (2006). Georgian Monarchy: Politics and Culture, 1714–1760. Cambridge, UK: Cambridge University Press. pp. 3–9. ISBN 0-521-82876-7. ↑ Plumb, J. H. (1967). "George I". Collier's Encyclopedia. 10. p. 703. ↑ Louda, Jiří; Maclagan, Michael (1999). Lines of Succession: Heraldry of the Royal Families of Europe. London: Little, Brown. p. 29. ISBN 1-85605-469-1. ↑ Pinches, John Harvey; Pinches, Rosemary (1974). The Royal Heraldry of England. Heraldry Today. Slough, Buckinghamshire: Hollen Street Press. p. 203. ISBN 0-900455-25-X. Dickinson, Harry T. (1973). Walpole and the Whig Supremacy. Introduced by A. L. Rowse. London: The English Universities Press. ISBN 0-340-11515-7. Marlow, Joyce (1973). The life and times of George I. Introduction by Antonia Fraser. London: Weidenfeld and Nicolson. ISBN 0-297-76592-2. Marshall, Dorothy. Eighteenth Century England 1714-1784 (1962). Smith, Hannah. Georgian Monarchy: Politics and Culture, 1714-1760 (Cambridge University Press, 2006).